Description : Download content to your mobile device Pixel fires on MO flow Carriers: All carriers Traffic Allowed: All traffic allowed unless it is under restrictions Traffic Restrictions: No adult traffic. Creatives need approval. No misleading creatives. Brand bidding not allowed. No instant winners. No competitions allowed. No WIN allowed. Keep only to game content only Geo: Switzerland TÃÂ©lÃÂ©hargez des contenus sur votre tÃÂ©lÃÂ©phone !Downloade die Inhalte auf Dein Handy!Scarica contenuti sul tuo telefono! 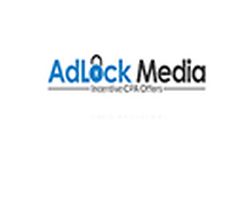 AdLock Media is an Incentive CPA Network specializing in content locking using Incentive CPA offers and CPI Mobile App Installs. Our wide range of content locking tools such as File Locker, Link Locker, and Offerwall give publishers the ability to earn revenue through a number of different content locking models. Our CPA Network provides exclusive incentive offers and CPI mobile app offers targeting visitors from all countries. Our sophisticated content locking tools allows publishers to generate revenue using ad-locking technology.